ATTENTION!!! The Metropolitan Water District of Southern California is offering water rebates of $2.00 or more per square foot for replacing your existing natural lawn with artificial turf. This offer expires on June 30, 2015. Lush, green lawns significantly enhance the appearance and increase the value of your property. However, maintaining natural turf is quite time-consuming and expensive. Fortunately, technological advances have improved the quality of synthetic turf to the extent that it is incredibly durable and it looks and feels so much like natural turf that you can hardly tell the difference. If you like the concept of having greenery around your property without all the related hassles, then artificial turf is the best option for you. California Creations has been installing top quality synthetic turf throughout San Fernando Valley, Santa Clarita Valley, Simi Valley and surrounding areas for over two decades. We take pride in being a premier artificial turf company, providing superior workmanship, extraordinary service and professional integrity. Our pledge is to exceed expectations and gain trust with our customers through exceptional performance by every member of our team. 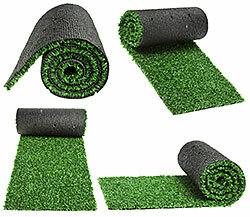 In addition to residential properties, artificial turf is now commonly installed at commercial and government properties as well due to its numerous advantages. California Creations is a professional installer of synthetic grass and artificial turf for pet areas, playgrounds, backyards, courtyards, athletic fields, pool areas, patios, decks and landscapes of all shapes and sizes. All of our artificial grass installations offer the natural look and feel of real grass without costly watering and maintenance. Monetary Savings: According to the Metropolitan Water district of Southern California, the average residential customer spends about 60% of their water on outdoor irrigation. With artificial turf, you will no longer be subject to costs associated with watering or maintaining your lawn. No Maintenance: Artificial turf does not require mowing, edging, fertilizing, weed abatement, reseeding, aerating, dethatching or watering. 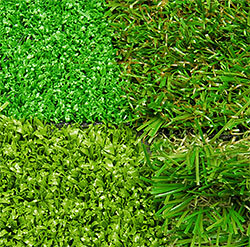 Continuous Beauty: Artificial turf stays dense and green continuously. No need to worry about bare spots, discolorations or winter dormancies. 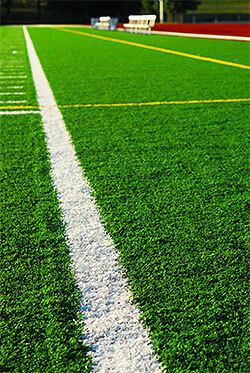 Foot Traffic Tolerance: Artificial turf is much more tolerant to heavy, aggressive foot traffic than natural turf. Quick Installation & Immediate Enjoyment: Artificial turf is typically installed within a day or two and you can fully enjoy it immediately without any usage limitations. Whereas, sod or grass seed take weeks or months to grow and establish. Pet & Child friendly: There is no risk of skin irritations or allergies caused by natural lawns and weeds. Also, you can wave goodbye to muddy paw prints and footprints. Eco-friendly: The water savings helps reduce the existing drought crisis. Also, since power mowers and trimmers will no longer be required, pollution levels will be reduced. Rebate of $2.00 or More per Square Foot: The Metropolitan Water District of Southern California is offering water rebates of $2.00 or more per square foot for replacing your existing natural lawn with artificial turf. This offer expires on June 30, 2015. Upon your request, California Creations will take measurements, survey your property for proper drainage and provide you with a highly-competitive free estimate. We do not cut corners, we use top quality materials and have highly-skilled installers to ensure that the installation is carried out with superior workmanship and efficiency. If you would like a free estimate for artificial turf installation at your residential, commercial or government property, feel free to call California Creations at (818) 833-1231 or send us your request via this online form and we will quickly reply.